As local businesses look to increase their reach and build out their consumer base many turn to outside agencies with the hope that they will be able to get their message seen by more consumers than they would be able to on their own. One of the platforms that agencies leverage to garner more attention for local businesses, Bing Places, has announced a slew of new features specifically for agencies. One of the various new features that Bing introduced is for agency registration. According to Bing an agency is anyone who has been authorized or contracted by another business to manage their listings on Bing Places. 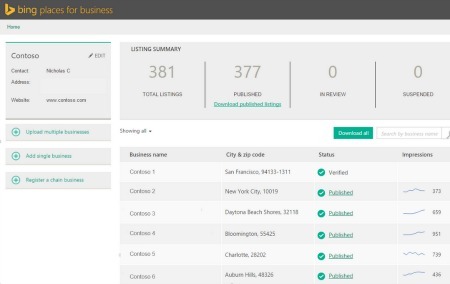 In order for agencies to be able to manage local businesses listings on Bing Places they must be registered. Once agencies officially register they can add up to 10,000 businesses at once to their listings. After agencies upload their listings to Bing Places, their clients must verify the listing to ensure that they are authorized to manage the information. What’s more, thanks to new sharing capabilities agencies are now able to share access to individual listings with their clients. Yet, perhaps the most interesting new feature to Bing Places is the new agency dashboard which enables businesses to monitor all their listings from one place.